The TF-1 is ideal for manhole applications, such as junction boxes, diversion chambers and interceptors, where the invert of the pipe is close to the floor of the vault. These vaults are designed to maximize the available gravity head; thus, the invert pipe is as close to the floor as possible. The TF-1 allows installations in such structures and are easily retrofit to existing structures, often replacing failed flap gates, without the need for breaking up the concrete floor to provide bottom clearance. The original Tideflex design, the TF-2, has a flare on the top and bottom of the valve. It has been superseded by the TF-1 and has been standardized by many consultants and owners. The patented TF-1 design is a product of 25 years of experience, research and development and testing elastomeric “duckbill” check valves. In addition to the benefits provided by a flat-bottom valve, the TF-1 also benefits from the increased angle of the upper “spine”. The inherent geometry and construction of the TF-1 yields a more durable check valve with greater strength to support not only the weight of the valve itself, but the weight of the water discharging from it. In large diameter valves, this weight can amount to several tons! The TF-1 can also be installed on the OD of elliptical pipe and many arch pipes. 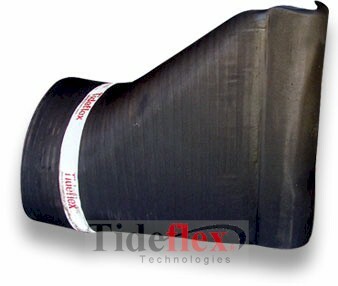 Tideflex Technologies also offers a thimble plate option allowing the slip-on TF-1 to be installed directly to a headwall or seawall. For higher backpressure ratings or to lower headloss while maintaining backpressure ratings, the Saddle Support Technology (SST) can be used in conjunction with the Series TF-1.